New to the forum so first I'd like to say hello. So I am moving into a new condo that has been all pre-wired and the design of the space also makes my options a little more limited on top of that. 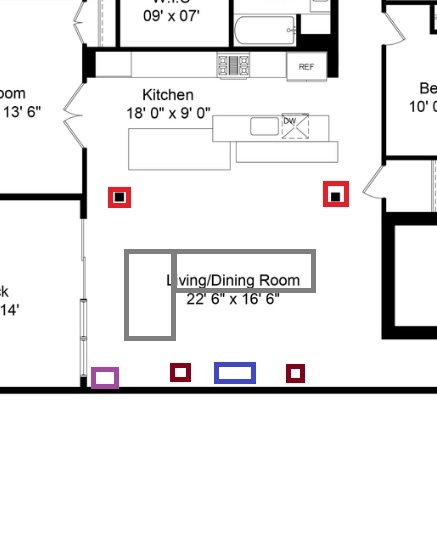 I have attached a picture that sort of shows the room, the subwoofer, ceiling rear speakers, general couch/listening area, and center channel/tv location. Since it is a new place I wanted to update all of my speakers. Due to space limitations, i was thinking of doing RP-160M front left/right speakers. For the center channel i was thinking the RP-250C. Then the subwoofer I was thinking of doing the R-110SW. Then there is no placement for rears in an ideal location so the ceiling was wired in the two areas circled in a red box. I am not sure which ones to go with though. The CDT-5800-C II or the CDT-5650 II. Also, I want to see if my choices in center channel and subwoofer should balance out the space appropriately. Further down the road i was going to put speakers in the rest of the place too. One room needing high humidity and a pair outside. So if the ceiling choice for the rear surround could be picked out in advance to balance out with the rest of the future whole home audio system in mind that would also be ideal. Personally I think you have room to put surrounds on the walls based on this pic, I'd try to do that before using rear in-ceilings. I'd try to at least get the R-112SW as well, the 10 doesn't dig very deep for home theater. Those bookshelves and center will be fine. The 160M's actually sound very nice and I'm surprised more people looking for a budget and/or small solution don't use them for mains. RP-160M's beats cheap towers in my opinion. I would do them on the wall however the room dimensions changed slightly and the area between the bedroom doors and the sliding glass doors just isn't quite big enough as well as wiring into that area now would be extremely tricky since it butts up against an exterior concrete wall. I think I am unfortunately going to have to go with the in ceiling option to which I'm very new to and don't really know a lot about when comparing to a standard speaker.